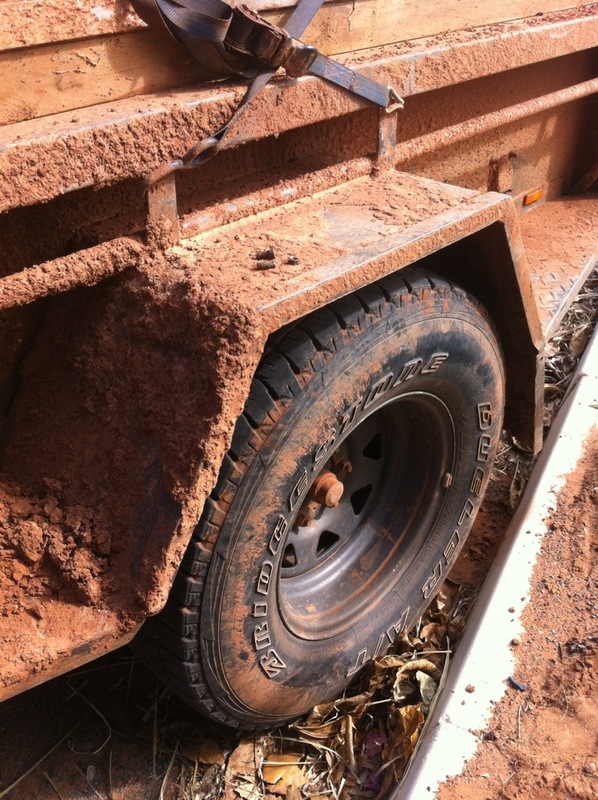 The story of our trip to the Pilbara in 2013. Here’s the track log of the trip to the Pilbara in July 2013, showing our exact location each moment of the trip. Treated ourselves to breakfast at the seaside cafe this morning and got talking to a couple from NSW who’d done a lot of off road travelling in their mid sized 4WD with no trailer, or roof rack. Masters of efficiency they had stayed in chalet and motel accommodation frequently and tented it for 12 nights in the 42 they had been away from home. It was a nice drive down the coastal highway past all the old fishing shacks, and the many large caravans heading north for the impending school holidays. The VeggieCruza feeling a whole lot lighter with the fuel load gone and cruising on 95kmh was more the average than the 85kmh over the first days of the journey. Arrived home mid afternoon to two very happy doggies who helped us unpack. Thanks for following, I hope you enjoyed the journey! Tonight I’ve added photos into all the other posts from previous days, so if you’ve already read them, time to go back and have another look. 538km today at an average of 80kmh. 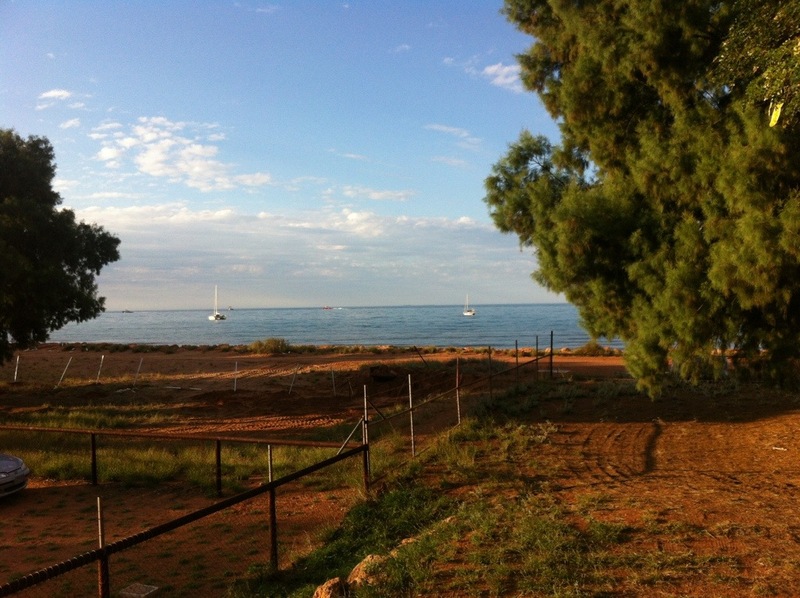 Pretty much a straight forward run from Carnarvon, through Geraldton, and on to Dongara Sea Spray caravan park. The wind and rain came up around 3pm and despite good intent, once we’d arrived at the caravan park the allure of a cabin was too much. Putting up a tent in the wind, and cold, no thanks. The evening ritual of refueling the VeggieCruza with canola is a potentially messy task, but generally there are no major spills or overflows. This trip I loaded 24 drums of used canola oil into the trailer. Most were 20 and 25 litre, with a few 22.5 litre. I made a frame up ages ago so each drum was stored in its own box so they wouldn’t rub against each. Some matting on the deck protects from underneath. This trip I loaded the bigger drums on the floor of the trailer in the frame, and stacked the smaller containers on top. To keep them a little clean, and keep rocks, mud and prying eyes, i cover the lot in shadecloth and tie it all down. To access and empty them, I lift the lid on the trailer and insert a hose into each drum in turn. This is all okay until I have emptied all the top ones, which need to be moved to access the bottom layer of drums. They’ve inevitably got covered in dust, drops of oil, and it’s all a bit inconvenient. A better system is needed! Something involving fuel bladders is in mind. They collapse as they empty, making storage easier at home. But as for this trip, refueling is over. The onboard tanks are full and give me a highway range of 850km. We’re 356km from after another epic trip into the great Australian outback. The sky is clear tonight, so it’ll be cold. Another bonus of having a proper house to live in! Rolled off a lazy 495km today. Arrived in Carnarvon around 3pm and contemplated moving on and finding a roadside campsite. But our preference is to be off the road at 3:30pm to give to fuel up, clean up after fueling up, set up camp, get the fire going, cook and eat dinner by the time it gets dark around 6:15pm. And doing all the above in a fairly relaxed fashion. Weather is cloudy and cooler. It’s been shorts and light shirt for a few days now, just the sort of weather the grey nomads chase. Not that we’re one of them…. Rest days are good. The grind of packing up camp, travelling, and setting up needs to be broken up with rest days each few days. Today’s rest day consisted of walking from one end of town to the other, around the boardwalk, past the charred but not destroyed town supermarket, and some other things. The burned or is it burnt? supermarket is a major issue for a small town. No grog, no smokes, no fresh fruit or veges, nor the regular supermarket items. Full credit to the local community, and by this afternoon they’ve got themselves operating again from the hardware store next door. What we found out was that there was an electrical fire that grew to the extent that the galv iron roof was charred. No doubt smoke has damaged many goods, and the water from the local volunteer fire brigade. I asked the Onslow Sun Chalet manager about finding a bolt to fix my trailer springs. It bothered me that if we headed back to the city with a problem, there was a long distance for things to go wrong. Also the slightly wrong wheel alignment would scrub the tyre and cause more drag and unnecessary use of the golden fuel. Seems like the garage was the very wrong place to buy a bolt, and we were directed to a local contracting company maintenance yard. Yes, they could help, but what sized bolt? Fair question. 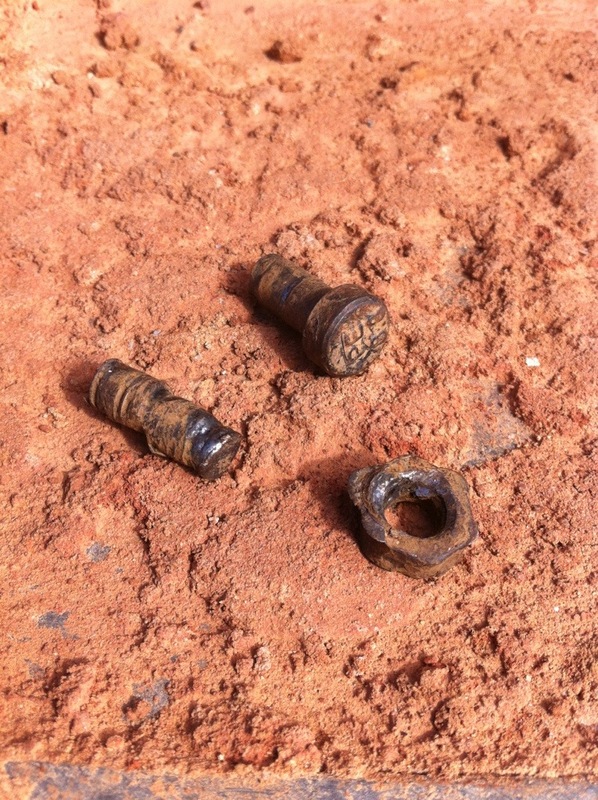 So back to the chalet, dismantle the spring, remove the three bits of the broken bolt and take it back to them, after disconnecting the trailer of course, that was up on a jack. Soon after we were back at the trailer trying to reinstall the now newer and stronger bolt, the original being plain standard strength, the new one being strong high tensile as it should have been in the first place. But installing a longer bolt meant lifting the trailer higher and our jack was at max height already with a few wooden blocks in place. Luckily a truckie was also staying here and he lent me his 20 tonne bottle jack. That should be enough I thought! And indeed it was, but only after some careful placement of blocks that may have appeared precarious to Kerry, so she only found out later… With some jiggling, levering and essential hammering, the new bolt slipped into place, the axle moved forward about 15mm into its correct position and the job was done. Yes, the trailer IS covered in mud. We also moved out of our two bedroom chalet to a smaller unit right on the beach front, nice! Plan now is to make our way home down the bitumen and take a few days.